Amazon Fresh is already present in Berlin and Hamburg. Amazon has given the green light for the expansion of its Amazon Fresh full range grocery delivery service in Germany, with a rollout of the service to Munich. It is expected that this could go live as soon as this month, Lebensmittel Zeitung reports. 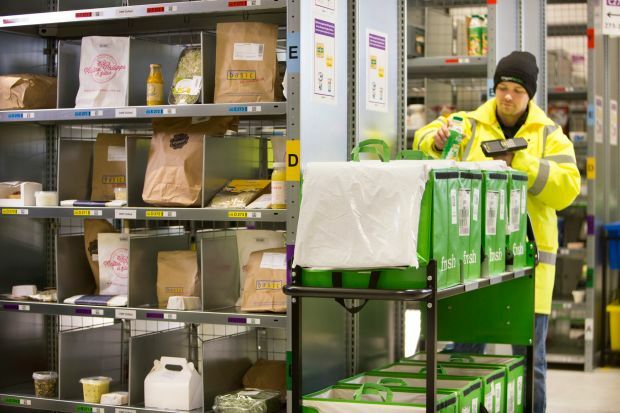 Director of Amazon Fresh in Germany, Florian Baumgartner, said that the company was “very pleased” with the development of Amazon Fresh to date and told LZ, “Positive feedback from our customers has convinced us to make Amazon Fresh available to customers in further regions”. Amazon’s distribution centre in Daglfing near Munich has been ready for several months for the launch of the service, and is kitted out with chilled, frozen and ambient grocery zones. Baumgartner told LZ that the most popular products sold on Amazon Fresh in Berlin and Hamburg to date were fruit, vegetables and dairy items. He said that organic products were also proving “very popular”. Last mile costs are a key consideration for any online retailer, however big or small and Amazon is hardly rushing ahead with its online grocery rollout. Instead it is proceeding carefully, weighing up the issue of last mile profitability for its grocery operations and implementing test and learn in each new market. The service operates to date from 21 metro areas in the US, London and Berlin in Europe (also servicing Hamburg) and Tokyo in Asia. Yet at the same time its high levels of service are resetting the industry standard and sending reactive waves through the industry where it is present. As it finally prepares to launch in Munich, the move by Amazon points to the success of its Fresh operation to date in Berlin and its willingness to take on further expansion. Since its market entry in May, Amazon Fresh has expanded its assortment from 85,000 grocery SKUs to 300,000 SKUs, including 200,000 non food items. It also increased its delivery area in July to include the city of Hamburg. In the UK a similar strategy was also implemented, with Amazon Fresh in London now delivering to much of South East England. By broadening its non food assortment, which also includes several sponsored items, and by increasing the number of shoppers it reaches, the company is working towards higher profitability for its grocery service, which will be key to its longevity. Meanwhile in the US it appears that last mile overheads are becoming a problem for Amazon's grocery delivery service in some regions. This week it was reported that Amazon Fresh plans to stop delivering to parts of suburban Pennsylvania, New Jersey, Maryland and California. According to Reuters, some customers have received notification that Amazon Fresh deliveries would be stopping at the end of November. This indicates that the company will focus going forward on densely populated, urban areas for home delivery and perhaps rely on pick-up services to reach shoppers in more suburban locations. This move makes sense and of course Amazon can now also collaborate more closely with Whole Foods, which was acquired at the end of August for USD13.7bn (EUR12.38bn). In its third quarter analyst call, Amazon indicated its intention to work more collaboratively between Amazon Fresh, Prime Now and Whole Foods going forwards. The company has already launched Whole Foods shop in shops online on Amazon Fresh and Prime Now in the US and UK. So, despite its keen ambitions in grocery, it appears that Amazon is like everyone else moving ahead with a careful eye on last mile overheads and making the services work profitably for the long term. Nevertheless its extreme service levels for grocery, including one-hour for Prime Now and same-day delivery for Fresh, will continue to put competitors under pressure as faster delivery becomes the new normal. And with Amazon poised to enter a second major city in Germany, as Lebensmittel Zeitung and LZ Retailytics presented last week at the Goldener Zuckerhut conference, even the slow-moving German grocery retailers cannot expect to remain exempt for much longer from increasing customer pressure to service the growing online channel.